Today, we are hearing the screams. The shouts are prevalent in the headlines, they are echoing in our communities, and social media has been shaken to its core. With hashtag movements such as #MeToo and women’s marches and rallies occurring on streets all around the world, it’s becoming more difficult to sweep women’s issues under the rug and ignore the fire that’s burning strong within women everywhere. However, at times it can get exhausting. And some days reading the headlines and hearing women’s stories is overwhelming. It can cause one to feel discouraged and wonder if progress is within sight. But when you look past the negative and focus in on the strength of those screaming, shouting and speaking up for women and girls all over the world, one begins to see there’s more people in our corner than ever before. Tchen served as Assistant to President Obama, Chief of Staff to First Lady Michelle Obama, and Executive Director of the White House Council on Women and Girls. She also led the first-ever United State of Women Summit. To say Tchen is a champion for women’s equality and empowerment is an understatement – she’s a full-fledged powerhouse. While she might not be a household name, the work she’s done behind the scenes of the machine that was the Obama administration, and the work that she continues to do, makes her a visionary, a leader and someone who can command any room and conversation with her impeccable insight, her admirable intelligence, her grit and commitment, and a laugh that echoes and reminds you of the importance of finding enjoyment and pleasure in your passions and pursuits. After obtaining her J.D. degree from Northwestern University School of Law and her B.A. from Harvard University, as well as locking down 22 years of experience as a partner in a Chicago law firm, Tchen was hired by the Obamas to lead their work on gender equality. 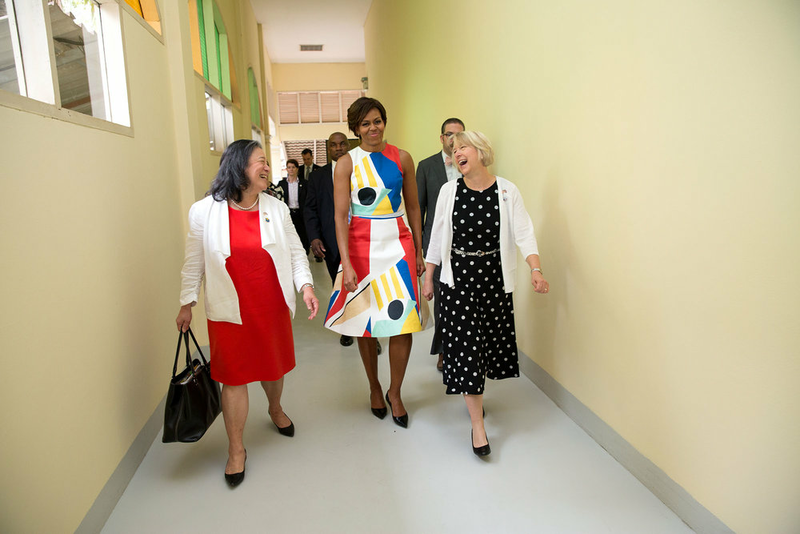 Working with the Obama administration, Tchen and the team spearheaded numerous initiatives that were aimed at empowering women. From the United State of Women Summit, to The Working Families Agenda and Reach Higher, to tackling the epidemic of campus sexual assaults and beyond, to say Tchen and the Obama administration were busy is a huge understatement. Their commitment to gender equality is astonishing, which is a large reason why Tchen has difficulty pinpointing one single initiative as the most significant or important. “We did a lot. Certainly, the last initiative that we started for the First Lady which was adolescent girls’ education and supporting 98 million adolescent girls around the world who are not in school right now completing their education was huge. It’s an initiative that I think is very key to progress in our world, addressing poverty, health and security. The data shows very clearly if you educate a woman that you will be able to make progress on all of those issues,” says Tchen. However, despite all the progress and work Tchen undertook and achieved, she is quick to note her proudest accomplishment from her time at the White House has nothing to with an issues initiative, but rather how the administration performed as a team. “The entire White House operated as a team, devoted to work every day, devoted to a single objective, which was to carry out the President’s agenda. He was very clear on the kind of values that he wanted our administration to represent of inclusiveness, of making sure that we treated everyone with respect and fairly who came into our doors and being open to hearing other opinions because we brought lots of folks in during our time there, of treating each other with respect and support. It was great and I don’t know whether I’ll ever have the opportunity to work for such a large team that was all focused on a single objective, that goes from the groundskeepers all the way up to senior assistants to the President,” says Tchen. One would think that after spending eight years with the Obamas, that Tchen would have some behind-the-scenes secrets to share, but she is quick to note there’s nothing truly at all that surprising about power couple Barack and Michelle. “I don’t think there is anything surprising I can tell you. One of the great strengths of the President and Mrs. Obama is they are entirely the same people when the cameras are off as you see when they are out in public. They are no different. They are very authentic and true to themselves, so there’s really almost nothing I can tell you that happens behind-the-scenes that people haven’t already seen out there in front of the camera,” adding that, “I think that’s one of the reasons why they had so much appeal to people is that people could sense that, and know that what they were seeing was very authentic,” says Tchen. An honest and refreshing answer to hear that there actually are politicians who are genuine and authentic. Further re-establishing that Barack and Michelle are more than just #relationshipgoals. While the groundwork towards women’s equality has certainly been laid by strong leaders such as Tchen and the Obama administration, and women like Billie Jean King, Eleanor Smeal and Doroles Huerta (all of whom Tchen personally regards as female visionaries), one can wonder if someone like Tchen who has committed a large portion of life towards the advancement of women ever gets discouraged herself. Spoiler alert: Just like every other woman who has heard Trump speak, she does. So, what motivates her to keep fighting the good fight? This week, Tchen is set to speak in Calgary (October 26) and Toronto (October 27) at the Canadian Women’s Foundation breakfasts – an organization she deeply admires and respects. “I love the work that women’s foundations do. They are generating philanthropy among women. They are teaching us how to give and to donate, and they are importantly, very thoughtful in giving out, meaning they are supporting great programs that support women and girls that empower and lift them out of poverty, in addition to leadership,” adding that, “All the luncheons and breakfasts I’ve attended that women’s foundations do are filled with great support for one another. A great energy is in the room because people are excited to see the work that their dollars are being put to. It’s always an inspiring event,” she says. As she gets ready to trek to the land of the Great White North, how does she think Canada fares on the gender equality spectrum? She’s quick to laugh and acknowledge that Canada is doing much better than our friends to the south and part of the credit is owed to Prime Minister Justin Trudeau. “I greatly admire what Prime Minister Trudeau did with his cabinet – his stepping up and saying, ‘I’m going to have a cabinet that’s gender balanced’. He showed it can be done. He implemented very talented ministers across the board. So often when we talk about how we need to diversify a board or we need to diversify the CEO seats or the C-suite, people say there aren’t enough candidates and that’s generally not the case. People are just not looking in the right places or they are overlooking the women that they have, or they aren’t willing to take a risk on a woman that they might take on a man. I think he set a great example for businesses, for NGOs, for his fellow politicians out there in taking the step he did,” she says. Most Canadians can unite in their patriotism and pride for their beloved country that celebrates diversity and fundamentally believes in caring and respecting one another, but as a single person, who isn’t in a position of power, it can be daunting to know where to begin building equality in one’s own backyard and community. Tchen believes advancement is achieved through support and connection. With an impressive resume, an overwhelming wealth of knowledge and insight, and an authentic, genuine passion towards making the world a better place for women and girls alike, the one piece of advice Tchen would give to younger women is two straightforward words, which she is first to acknowledge are much easier said than done. Today, culturally we are witnessing a shift in the way women interact with one another. Building a collective and a community of women that support one another, as opposed to competing and tearing each other down, is starting to become the norm. A norm worth celebrating, fostering and cultivating. Because when women support one another meaningful, magical and monumental things happen – something Tchen hopes to see more of. “I think it’s very important to reach out to allies - I think that’s one of the things we don’t do enough of is bring all sorts of groups together, to work together across issues. That’s one of the things we try to do with The United State of Women. It is our goal is to bring together all the different groups that are working on different issues for women together so that they’re connected to each other, they’re talking to each other and they’re sharing best practices,” says Tchen. While nurturing those relationships is critical, Tchen also reveals how we interpret women’s lives also requires a cultural shift as well. And with that, Tchen unequivocally proves that not all heroes wear capes. Don’t miss your opportunity to hear Tina Tchen speak in Calgary at the 2017 Canadian Women’s Foundation Calgary Breakfast. To purchase tickets or learn more about the event, click here.